I'm using black tea in this example. That is why the tea is a darker color. 1 Teaspoon of dried culinary lavender buds - If you do not have lavender bushes and a dehydrator (I have a Nesco dehydrator that I can’t recommend enough!) 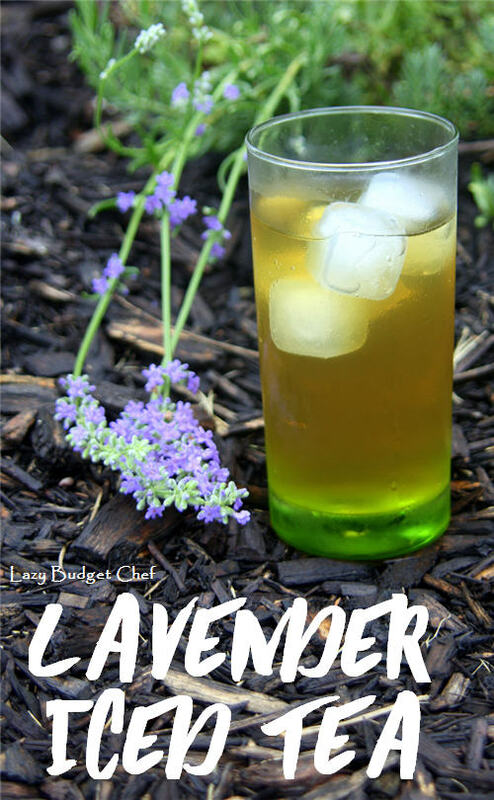 to dry the buds for this recipe, you can buy dried culinary lavender buds from Amazon. Make sure you use culinary lavender because it is not treated with additives to deepen the color and smell that taste awful. Disclosure: I’m always thinking about kind and frugal folks like you - that's why I some ideas I'm sharing are from companies I like and personally use.If you get the goodie, I might get a few coins thrown my way that keeps me supplied with enough tea and tacos to keep bringing YOU smart budgeting ideas every week! Thank you for supporting Lazy Budget Chef! 1. Put 5 tea bags and the tea ball filled with dried lavender buds in an empty pitcher. 2. Heat one tea kettle full of water and pour it over the tea bags in a room temperature pitcher to reduce the chance of the extreme heat reacting to a cold pitcher and cracking it – science yo! 3. Fill the rest of the iced tea pitcher with room temperature water and allow the tea bags to steep for 4-15 minutes depending upon how strong you like your iced tea. Be aware that the longer you let your tea steep it has a good chance of becoming bitter. I let my lavender iced tea steep for four minutes because I’m using green tea bags and plan to drink it unsweetened. 4. Remove the tea bags and ball from the iced tea. Tip: If you have a compost bin, compost bins LOVE spent tea bags! 5. Optional: Stir in 1/2 cup to 1 cup of sugar or honey.The amount of sugar you use depends upon how sweet you like your tea. Most of the time, I skip the sugar altogether. When I add sugar, I start by adding a 1/2 cup of sugar and add more if I get complaints from guests that my sweet tea t isn’t sweet enough. 7. Pour a cup and drink it up! Do you like your iced tea sweetened or unsweetened?